The Winter Palace by Eva Stachniak is an historical fiction novel set in Russia during the rise of Catherine the Great. Court life during the period (1730s - 1760s) is seen through the eyes of Varvara, servant and spy to Empress Elizabeth of Russia. Daughter of Peter the Great, the Empress is brilliantly portrayed as a vain and eccentric woman, taking many lovers and always surrounded by her cats when Varvara arrives at the palace as a newly orphaned young girl just trying to survive. Prior to picking up this novel by Eva Stachniak, my knowledge of this period in Russia was limited, although I was inspired to find out more, learning the Winter Palace (of the title) is real and the novel is based on historical fact. Although the title states that The Winter Palace is A Novel of Catherine The Great, I personally found it was Varvara's story first, Empress Elizabeth's second and Catherine's third. This didn't interfere with my enjoyment of the novel however, and I found myself looking forward to picking it up during the hot summer weeks over Christmas. Catherine the Great comes to power in 1762 and goes on to rule for another 30+ years beyond the ending of the novel and I've since learned there is a sequel called Empress of the Night: A Novel of Catherine the Great. Published in 2013, it is narrated by Catherine the Great herself and I'm very tempted to add it to my TBR pile straight away. Highly recommended for lovers of historical fiction and court intrigue, spies, ambition, loyalty and betrayal. 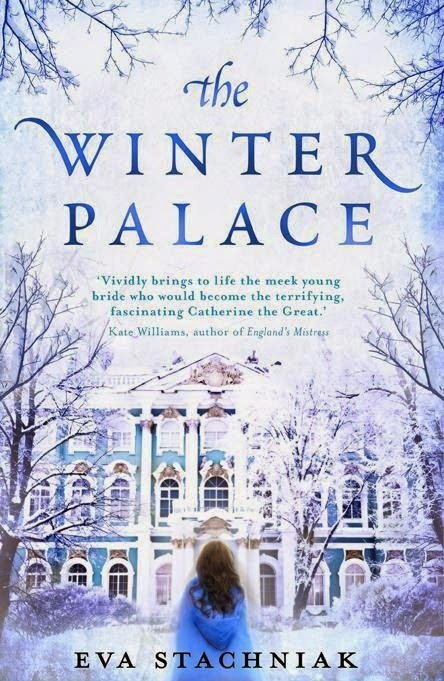 Click here to buy a copy of The Winter Palace by Eva Stachniak, from Boomerang Books. Don't you just love the cover too?